‘Two Of A Crime’ is one of the first albums I’ve listened to on which I’ve been jealous of something other than musical ability or song writing skills. I found myself genuinely envious of the bond that Max and Sherri share. It’s partly because the album is the sound of two people incredibly comfortable with each other and also because they manage to convey it brilliantly. I imagine it’s difficult to truly capture a relationship between two people on record but ‘Two Of A Crime’ is a shimmering testament to the love the two share. Tracks like ‘She Chose You’ and ‘Wishbone’ on which the two directly address each other through stories are passionate and well written, perfectly displaying the expected chemistry between the two artists which breathes life into every second of their debut album and makes for some truly stunning music. Slow burner ‘Torch Song’ is staggeringly beautiful; supplying some touching goosebump moments as the two sing about their relationship and commitments to each other. What makes ‘Two Of A Crime’ even more rousing is that instead of encasing their music in their own love-filled bubble they open up and allow the listener into their relationship and lives together. It means that the album is intimate whilst outgoing, and it’s impossible not to be wrapped up and taken in by the charm that oozes from the two of them. There’s a clear understanding between husband and wife that only comes from being that close to another person and it sets ‘Two Of A Crime’ apart from basically every artist to use both male and female vocals in their music, making for truly magical music at times. ‘Two Of A Crime’ is also immaculate vocally. Sherri’s singsong vocals perfectly complement Max’s deeper delivery, even on the more emotional tracks, and the result is often breathtaking. The frequent back and forth delivery of the title track and ‘Little Light’ is infectious, whilst making the songs more of a conversation between the two. ‘The Bat And The Cave’ was easily my favourite track, with the two singing in tandem for the majority. The soaring chorus on which the two merge is the albums strongest moment, and you get the sense that the two operate on exactly the same wavelength when it comes to music and aren’t afraid to lay themselves bare before the other. It means that ‘Two Of A Crime’ flows in a way very few records do, as the two contributors are perfectly entwined inside and outside of their music, with closer ‘Tangled Up’ suggesting as much. The album has its fair share of personal moments but a good amount of upbeat tracks like ‘You’re Welcome’ which possesses a more punk rock vibe and is one of the more dynamic songs, differing from the acoustic and stripped back tracks which make up most of the album. ‘Let’s Start A Band’ has a very Say Anything feel to it and could easily have been plucked from ‘In Defence Of The Genre.’ There are elements of both Eisley and Say Anything in the eleven tracks here, and it brings some familiarity to the songs. As per usual Max excels lyrically even though the songs here are much less schizophrenic than his past writing. 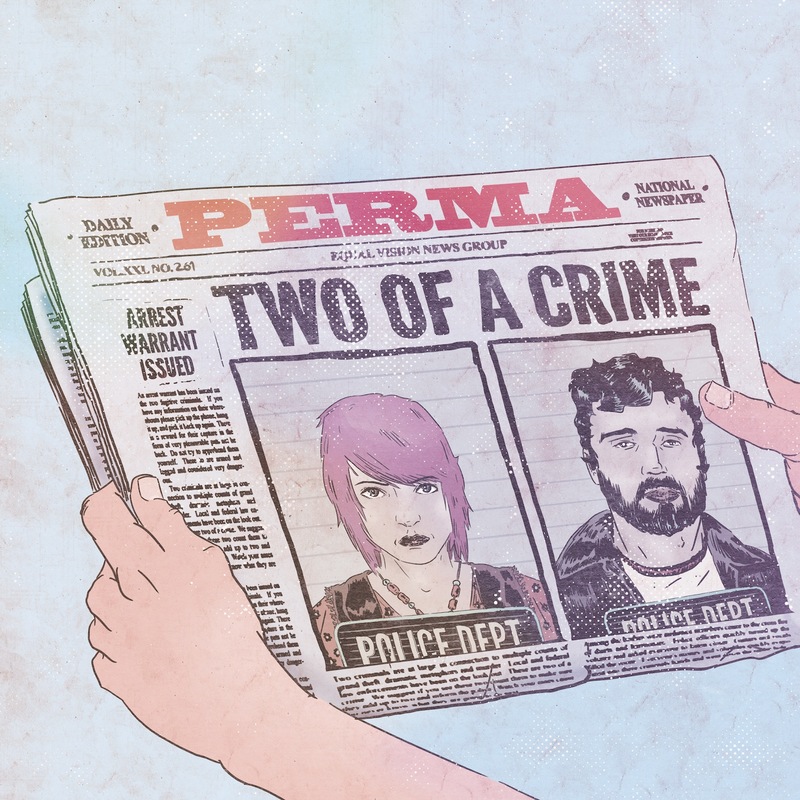 He’s touched upon his relationship with Sherri numerous times across his bands discography but ‘Two Of A Crime’ is much more expansive, and is all the more affecting because of it. Also, it’s never overbearing to the point where the record becomes sickly sweet – remaining romantic without overdoing it. There’s never been any doubt that both Sherri and Max are exceptional musicians, but when the two combine and work as a single body the music produced is very impressive. In terms of musical chemistry it’s one of the tightest albums I’ve ever heard and that also makes it one of the most moving and delightful. ‘Two Of A Crime’ is an album brimming with emotion and love and it’s hard to convey exactly how it made me feel as a listener. I’d say it’s one of those albums that really needs to be heard in order to be admired as it deserves, and for that reason I couldn’t recommend it more.